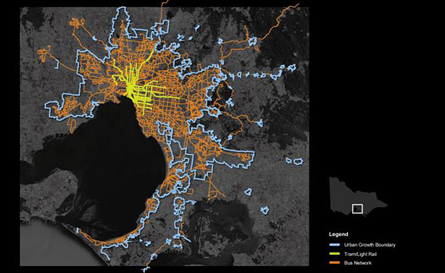 In Australian cities, the aim should be to maximise development along new and future road public transport corridors. 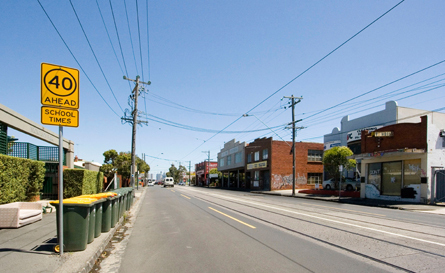 A possible future for Nicholson Street (looking south towards the city), shown as current utilisation. Streets will be modified to favour rapid public transport, bicycles and pedestrians over motor vehicles. 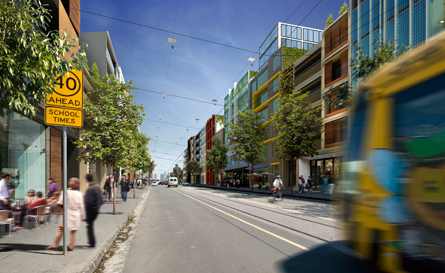 Combining dedicated tram corridors with extended dedicated bus corridors could achieve a rapid expansion of Melbourne’s public transport infrastructure. 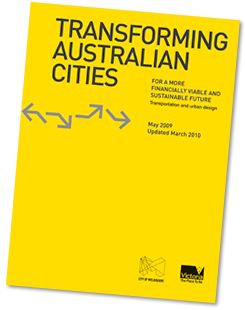 Transforming Australian Cities (TAC) was initially commissioned by the Victorian Department of Transport and the City of Melbourne to establish the potential to transform metropolitan Melbourne to meet the projected population of 8 million by 2050. The study specifically does not deal with rail based public transport and Activity Centres as these have been the subject of extensive investigation over the last ten years. Known capacity figures for Activity Centres and some redevelopment sites have been referenced to allow a more comprehensive understanding of existing capacity with the current Melbourne Metropolitan Boundaries. This study looks at the potential yield that could accrue through good urban design of the urban corridors/strategic sites. A number of assumptions, as illustrated below, were made in determining the potential for future development along these tram and bus corridors. We are today part of a new revolution, ‘The Urban Revolution’. Cities that housed 200 million people or ten percent of the world’s population in 1900 now accommodate 3.5 billion people or fifty percent of the world’s population and will, by 2050, accommodate 6.4 billion people or over seventy percent of the world’s population. Many developing cities will have to grow at over six times their current growth rate to accommodate this population explosion. 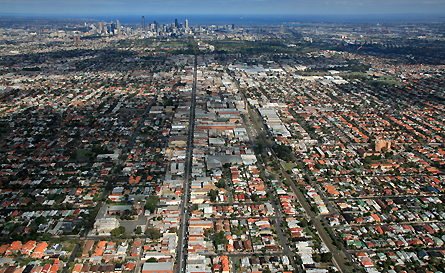 More than 80% of Australians already live in cities that are projected to double their size in the next 40 years. Melbourne, a city of 4 million, in 2009 has seen a 40% increase in the demand for housing at a time when, as a result of the Global Financial Crisis, house starts have declined by 3%. The enormity of the challenge of building the equivalent city and infrastructure that has taken 175 years in under 40 years is daunting. Add to this the fact that cities today are directly or indirectly responsible for over seventy five percent of the world’s Green House Gases and we are starting to realise that our cities, as in the Industrial Revolution, are slowly ‘choking us to death’. easily linked to the form and infrastructure of the Industrial City today, these similar impacts are less visibly linked to the form of our modern cities. successful model while at the same time transforming our existing cities to a low carbon future. This study looks at the potential yield that could accrue from this approach to intensification of the urban corridors. A number of assumptions, were made in determining the potential for future development along these tram and bus corridors. The secret is to recognise the need to transform our existing infrastructure rather than building and expanding in the hope that increased size will improve our capacity. For further information download the summary document here (3.4mb pdf).